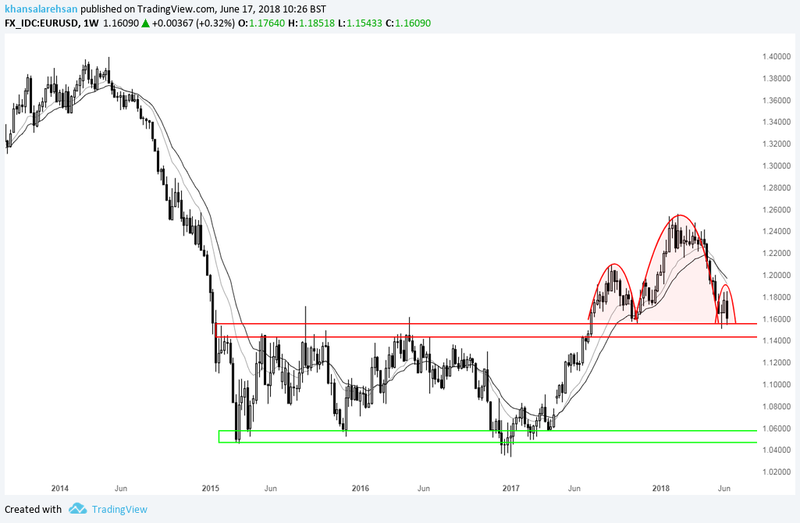 The USD appreciated last week, as expected in my other posts. We had a week loaded with high profile event risk. I believe ECB intentionally announced its dovish policy and just a day before that FED had one its most hawkish monetary policy announcements. Also the influence of the FED monitory policy caused precious metals depreciating during the Friday session. I posted the following call for Gold and hour after ECB when it was round $1308. But before I start reviewing these two currencies, see the EURUSD 6 month candle. The last candle is still open but will be closing in two weeks. It is very bearish as it pulling back from EMAs and it may even close as a bearish engulfing candle. Regarding USD, first chart is 6 months USD equally weighted average chart (to replicate see the screenshot title). It is Bullish engulfing unlike EURUSD which was shown above. On daily also we have a flag formation and the upper band of the flag was broken on Friday session, when we had a pullback in DXY . DXY daily also is about to break the Inverted H&S . On Friday it reached to 95.13 and could not break the Neckline. Emerging markets have opposite correlation with USD and it broke the Neckline of the H&S on Friday. Shanghai compost is the same as Emerging markets and opposite correlation with USD expected. It broke the Neckline too. As USD has been becoming a stronger currency we observe more capital coming into Treasury bonds as a safe heaven and not in “Gold”. Here is junk bonds see the follow of the capital in this market. and that caused treasury Yields to retreat in contrast to the price on the Friday session. Nikkei has a positive correlation with USD and it is heading higher and although the Friday’s candle is not green but closed 0.5% upper than the gap. Basic textbook rule for wedge formation is rotation from upper band of the wedge to the lower band of the wedge . and France Yields which I think it made a false breakout of the wedge and we may see something like Gold for this market. Overall I am very bearish on EURUSD Trade and here is the trade I posted recently for EURUSD . If you enjoyed this analysis please “LIKE” and leave a comment. Comment: like most of the charts above with H&S pattern, weekly EURUSD also formed a H&S pattern. 3 weeks ago EURUSD attempted to break the support line (current neckline) but it could not because of the lack of fundamentals. I think ECB dovish tone and FED hawkish tone has given enough momentum to this cross to break the support. See how bearish this cross will be if it breaks to support. Almost nothing to stop it to the next level of support! EURUSD opened with a gap lower as you can see in the chart below. The gap is not filled yet and the pair is trading 0.30% lower today as expected. Please be aware the Draghi speaks today in Portugal at 6:30 UK time. I doubt anything significant comes out of that as most of the damage has already done on Thursday by presenting dovish monitory policy. Comment: Gap filled on EURUSD but we have this wedge forming on hourly equally EURO weighted average. Comment: Draghi said that monetary policy in the euro area will remain patient. It is possible to have the rate hike even after Summer 2019 if Inflation does not backup the Euro economy and he said that it is even possible to continue asset purchases after December 2018 although the plan is to cut QE in Dec after cutting that to 15B in Sep. Comment: Massive breakout of Shanghai composite. Comment: We do not have any other major fundamental catalyst any time soon to take EURUSD lower. We should see the major support on weekly (see above) broken soon otherwise EURUSD may struggle going lower. Comment: Clear breakout of the USD equally weighted average (daily) as expected. Comment: Here is the equally Euro weighted average (hourly). It is forming a wedge. I would like to see a false breakout of it during Draghi speech and then I can add to the Short EURUSD when the wedge broke the other side of the wedge. Fundamentals suggest the downside breakout. Comment: Sorry to send you spams here but I just realized that I have became All time UK Top author. Comment: This morning we see EURUSD traded 0.25% lower and this is not because EURO depreciated. It is simply stronger dollar. Referring to the chart above I want to see these two key support lines to be broken. However myself added shorts on the most recent swing high, as there is no major risk even on the calendar for EURO for the near future. Comment: See the forth chart from the top. I was referring a possible breakout of the Flag formation on the USD weighted average (daily). Compare the following with the chart above. Question is that whether DXY can break the resistance and can EURUSD break the support? But look at DXY. It is not quite clear yet whether it is going to make a breakout or not. But you know that all global markets are correlated. Hence I would expect the same pattern on DXY. @malikmehboob, Thank you. TP and SL are on the right axis. Go to the most recent EU trade that I have and you will see that. Congratulations, you sure are the best! @Sydneysky, Thanks for your support mate.